The Nestle Cerelac range in Malaysia now comes with Nutribites. The new biscuit for little ones from 12 months old and above is fully imported from Italy. It is made with carefully selected ingredients such as wheat, butter, milk & honey to deliver important nutrients especially high in iron, calcium, vitamin B1, B2 and B6. Nutribites is an extension of the Cerelac brand into the biscuit segment, which is a follow on from the earlier launch of the Nutripuff finger food in 2016. 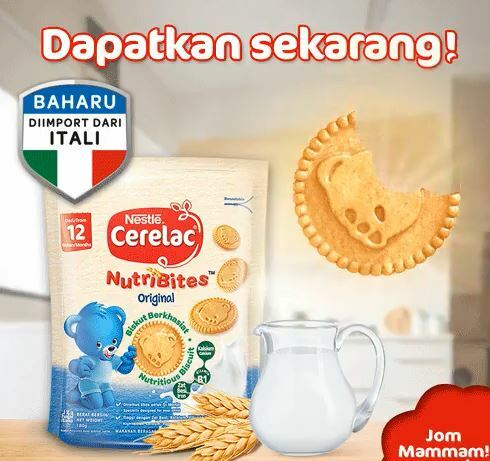 After the latest move into biscuit, Cerelac can start considering innovating around biscuit rusk, dessert, noodle and pureed baby food targeting busy parents who are looking for convenient, healthy and yet affordable food products for their babies.